For hydrostatic testing purposes, there are two: one is the process of hydraulic test to test whether the leaking pipe, that test tube sealing performance; Another is confirmatory hydrostatic test to test the strength of steel adequacy. In general, low and medium pressure boiler pipe hydrostatic test is part of the process of the hydrostatic test, which is the density of material testing and inspect and whether the material is a continuous dense; it is not verify the strength tests. From the intensity of mechanics of materials theory, seamless steel components are thin and long, and its diameter is very small, even for thin-walled capillary tubes can withstand great pressure. That is to say, when low and medium pressure boiler tubes test pressure, even when there are deep cracks, can not happen leaking. Hydrostatic test is that many product specification test methods are available. This test can detect leakage of liquid from the inner wall of the case outward can be observed with the naked eye or with a pressure drop to determine. Hydrostatic test can not be found through-wall defects but very close or very close to the wall thickness in depth but not yet fully penetrated defects. Conducted for each pipe eddy current inspection after the low and medium pressure boiler pipe hydrostatic testing is not necessary to replace the hydrostatic test eddy current testing. 1.test section at the end of block, slow water injection, the tube gas discharge. 2.after the steel tube filled with water, water tightness checks. 3.made slow progress in steel pressure appropriate USES manual pump, booster time should not less than 10 min. 4.stop pressure after test pressure, observe the 10 min, must not exceed 0.02 MPa pressure drop; Then put the testing pressure drop to the working pressure, steel pipe for visual inspection, leak-proof is not qualified. 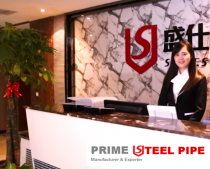 5.after arrival, steel pipe pressure, leakage and pressure drop more than a specified value, check the steel tube, after the reason to discharge the leakage, as stipulated in the above to test again, until it meets the requirements. 6.the temperature is lower than 5 ℃ under the environment of water pressure and water capacity, reliable antifreezing measures should be taken, after the test, water should be put. We are manufacturer of Carbon Steel Pipes and supply high quality Carbon Steel Pipes in both large and small quantities worldwide & offer you the best prices in the market.